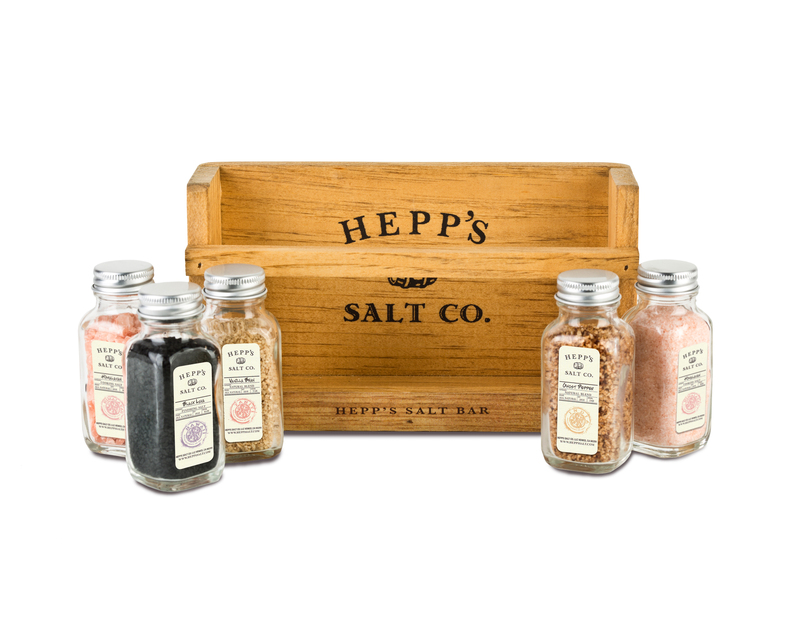 HEPP'S HOLIDAY GIFTS SET ARE HERE!! We know it seems a bit early to be talking about holiday gifts, I mean geez Thanksgiving is still at least two and a half weeks away right?? True but this year is unique because Hanukkah one of the very important holidays celebrated every year starts the day before Thanksgiving so we want to help you be prepared and ease the holiday panic!! These gift boxes are specially made for HEPP'S designed by us for you, our goal is to provide useful yet unique gifts that will surely surprise everyone on your list. Also we have limited quantities so this year it is better to buy early before they sell out!!! 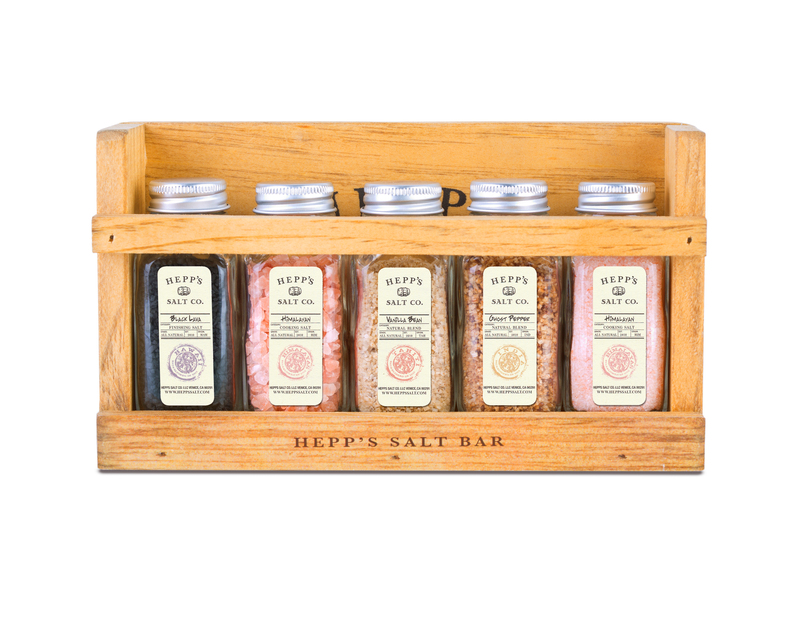 HEPP'S Mini Salt Bar HEPP'S Salt Box Choose either the Mini Salt Bar or Salt Box in any of the collections listed below, each box comes with 5 different sea salts in 2 oz. jars with screw cap lids. ULTIMATE FINISHING COLLECTION: $60.00 The Ultimate Finishing Collection is several of the finest finishing salts the world has to offer. Use these salts as a garnish and bring out your inner gourmet chef! Cyprus Flake Sea Salt: This is truly one of the most unique salts in the world. These pyramid shaped crystals add so much flavor and crunch to any meal. Black Truffle Sea Salt: This combination of Italian Black truffles and sea salt adds a decadent earthy finish to any of your favorite dishes. Only Italian Truffles and sea salt make up this unbelievable salt. One pinch of this will instantly transform you in a gourmet chef. Aussie Flake Salt: This Delicate peach colored salt is light and crunchy. This Australian salt resembles a snowflake and is the most versatile salt you will find. Applewood Smoked Sea Salt: Start with an all-natural flake salt and slow smoke it using real applewood. Delicate smolder with a subtle hint of fruit makes this smoked salt very versatile. Black Lava Sea Salt: This obsidian hued Hawaiian lava salt is truly a beautiful finishing salt that adds a clean taste and stunning color to any meal. CHEFS COLLECTION: $60.00 Chef’s collection was put together for the master chef within all of us. Whether you are a professional chef, home cook, or love good food, this collection is a must have for the kitchen. Whatever you are cooking, add any one of these salts and taste the difference! Applewood Smoked Sea Salt: Start with an all-natural flake salt and slow smoke it using real applewood. Delicate smolder with a subtle hint of fruit makes this smoked salt very versatile. Black Truffle Sea Salt: This combination of Italian Black truffles and sea salt adds a decadent earthy finish to any of your favorite dishes. Only Italian Truffles and sea salt make up this unbelievable salt. One pinch of this will instantly transform you in a gourmet chef. Aussie Flake Salt: This Delicate peach colored salt is light and crunchy. This Australian salt resembles a snowflake and is the most versatile salt you will find. Roasted Garlic Sea Salt: This isn’t your ordinary garlic salt. Blended with real roasted garlic, this versatile salt packs a salty, garlic punch. Black Lava Sea Salt: This obsidian hued Hawaiian lava salt is truly a beautiful finishing salt that adds a clean taste and stunning color to any meal. HOT Box Collection: $50.00 If you are a “Pepper Head” this collection is for you. From Chipotle to Scorpion, we have the hottest salts in the world in this collection. Chipotle Sea Salt: Add a warm and smoky pepper sensation to any meal with Chipotle salt. The delicious flavor of the chipotle pepper infuses a toasty yet mild layer to any dish. Habanero Sea Salt: The Habanero pepper is a spicy pepper that wakes you up with its heat. Use this spicy salt to transform any dish into a spicy treat! Ghost Pepper Sea Salt: With a savory-sweet kick, this is one of the hottest salts in the world! Careful, compared to the bite of the King Cobra, this heat will sneak up on you!. El Scorpion Sea Salt: Named as the hottest chili pepper on the planet, this combination of Trinidad Scorpion pepper and sea salt, this will test the limits of even the most daring! CONSIDER YOURSELF WARNED 7-FIRE Smoked Sea Salt: This is the mother of smoked salts! Smoked in 7 different types of wood, 7-FIRE is the boldest smoked salt out there. MIXOLOGY COLLECTION: $45.00 It’s happy hour somewhere! Try incorporating these unique sea salts when mixing up your next cocktail. 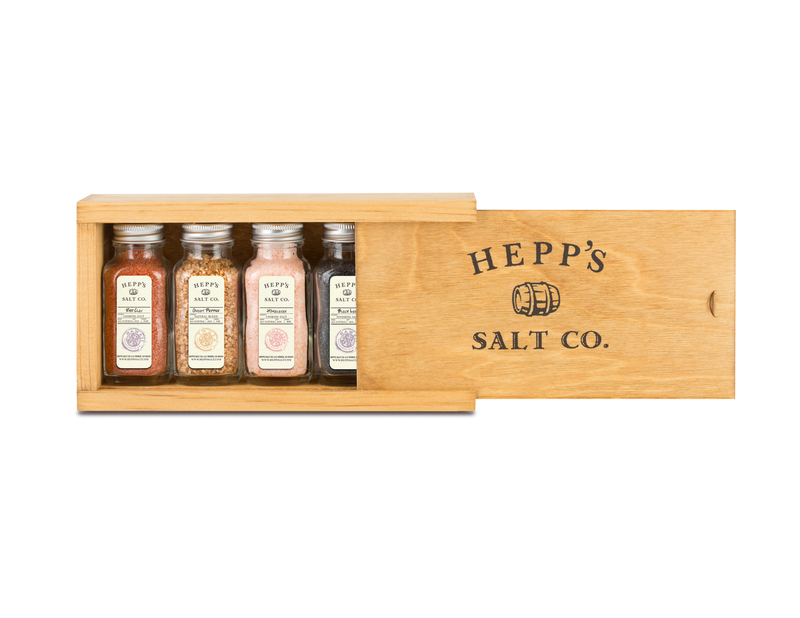 HEPP’S Mixology Collection is sure to make your cocktails a hit. Not just used for the rim anymore, sea salts add a whole new dimension of flavor to your recipe. Applewood Smoked Sea Salt: Start with an all-natural flake salt and slow smoke it using real applewood. Delicate smolder with a subtle hint of fruit makes this smoked salt very versatile. Black Lava Sea Salt: This obsidian hued Hawaiian Sea Salt adds brilliant color to any drink. This is a truly beautiful salt that adds stunning color to any drink Ghost Pepper Sea Salt: With a savory-sweet kick, this is one of the hottest salts in the world! Careful, compared to the bite of the King Cobra, this heat will sneak up on you! Lemon Sea Salt: The fresh flavor of lemon come alive to create a refreshing salt that adds a distinct yet subtle zing to any cocktail. Thai Ginger: This sea salt mixed with exotic ginger, creates a striking flavor that will make your taste buds explode. Smokehouse Collection: $40.00 Master of the Grill? Not without this smokehouse collection! Smoked salts are so versatile you can use them on almost anything. 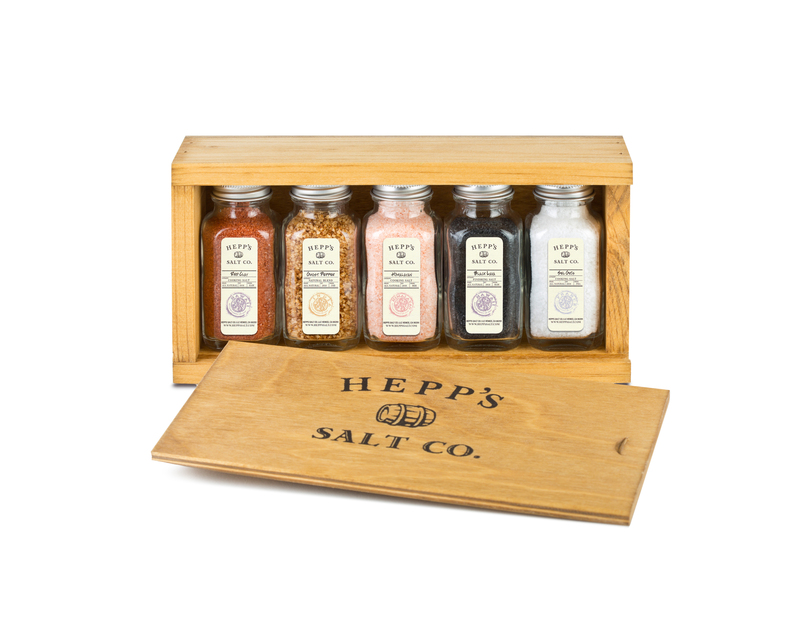 HEPP’S Smoked salts are not made with artificial flavors, colors, or liquid smoke, just sea salt and natural smoke from the wood. Applewood Smoked Sea Salt: Start with an all-natural flake salt and slow smoke it using real applewood. Delicate smolder with a subtle hint of fruit makes this smoked salt very versatile. Alderwood Smoked Sea Salt: With a clean, light smoke from the alderwood tree, this smoked salt is mild enough to use on fish yet versatile enough to use on meat. Hickory Smoked Sea Salt:Getting that true southern flavor has never been easier that brining hickory salt into the picture. With a clean bold taste, Hickory adds a twang to your palate. 7-FIRE Smoked Sea Salt: This is the mother of smoked salts! Smoked in 7 different types of wood, 7-FIRE is the boldest smoked salt out there. Mesquite Smoked Sea Salt: The official smoke flavor of Texas, this hearty smoked salt adds a strong flavor to any meats or Veggies. Careful, this salt has a strong smoke flavor. BUILD YOUR OWN: $65.00 Feeling creative, build your own collection, choose 5 of any of the following * limit 2 truffles per set. Aussie Flake, Black Lava, Cyprus Flake, Himalayan Fine, Himalayan-Coarse, Red Clay, Sel Gris, Chipotle, Ghost Pepper, Habanero, Scorpion, Lemon, Roasted Garlic, Spanish Rosemary, Thai Ginger, Vanilla Bean, Smoked Alderwood, Smoked Applewood, Smoked Hickory, 7- Fire Smoked, Black Truffle, White Truffle.